What paintball fields are near me? Do you live in the Minneapolis and Twin city area? If so, you’ve come to right place. Our downtown Minneapolis facility will meet your needs for action and entertainment. Walk-ins are welcome certain days of the week, and private reservations of groups can be accommodated any day of the week. 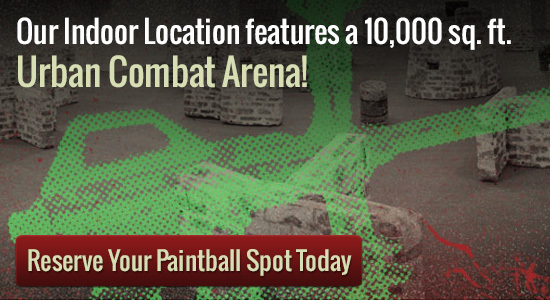 If you’re located in the St. Paul area, there’s another great indoor paintball field near downtown St. Paul. Opened in 2014, Air Assault Indoor Paintball is the newest facility to the area. The facility features a 18,000 square foot playing field. If outdoor paintball is more your style, Action Packed Paintball in Jordan, MN is just a short drive from the Twin Cities. It features multiple playing fields, including a city, a fire base, and traditional wood fields. All of the facilities accept reservations for groups and also have walk-on play sessions available. Check their web sites for pricing and hours of operation. Be aware that outdoor paintball in MN is typically a seasonal activity. Most outdoor paintball fields in Minnesota close in the late fall and don’t re-open until early spring. The two indoor fields mentioned above are climate controlled and open all year. When most people think about paintball, they envision stalking their friends through the woods. They don’t realize that paintball can be played indoors and there are commercial indoor fields throughout the country. Indoor paintball’s biggest advantage is that it takes the weather out of the equation. It also makes it possible to play paintball in the late evening and into the nighttime hours. These advantages make it much easier to plan a paintball party. Gone is the risk of bad weather ruining your plans. The nighttime hours make it possible to schedule a party on a weekday, after school or work. We don’t have to tell you how brutal Minnesota winters can be. An indoor paintball field can be a welcome distraction from the drudgery of winter. All of our facilities are heated and air conditioned, so you’ll find the temperature to be comfortable regardless of the season. Planning your paintball party is as simple as giving us a call or making your reservation online. If you still have questions about planning the perfect paintball party, give one of our party specialists a call at 612-378-0385. They’ll be happy to assist you.